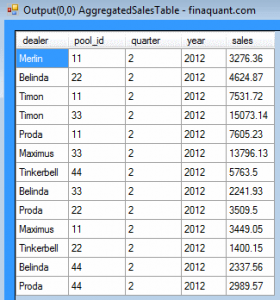 Dealer, sales or any other kind of commissions can be calculated quite easily with the table functions of the .net library finaquant® calcs, as the following example will demonstrate. Dealers receive sales commissions proportional to their sales totals for each product group in a quarter. 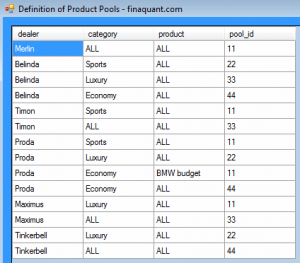 Product groups (or pools) can be defined by category or individual products for each dealer. The commission scale with tiered rates (class or level scale logic) for each product group (or pool) determines the amount of commissions to be paid. All input tables are fetched from an external database using the event functions of Calculation Nodes that are triggered before any input table is read from the Generic Database. For this demonstration we use a MS SQL database (SQL Express) named externaldb as the external, and another MS SQL database named finaquantdb as the generic database. Filters input tables according to the Calculation Instance parameters. 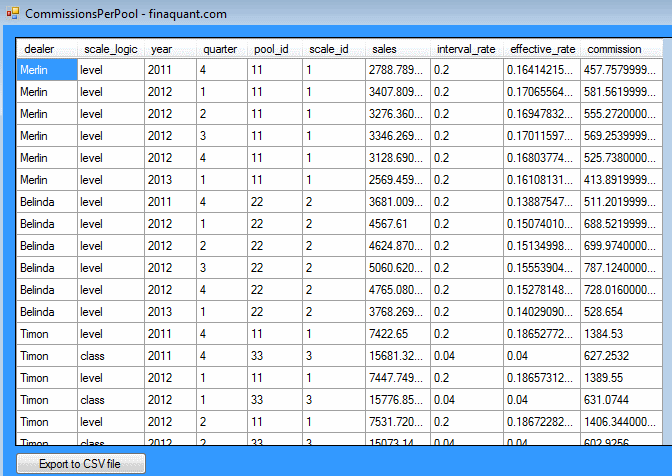 For example, if you want to calculate commissions for the 2. quarter of 2012, a sub-table containing the sales data for only this quarter will be passed to Calculation Node. 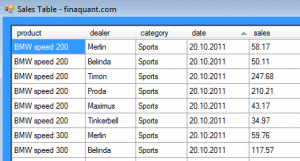 Compares the instance tables in Generic Database finaquantdb (if there already exist) with the filtered inputs from the External Database. It overwrites the instance input tables only if these two set of tables are not identical. Calculation Nodes are configured such that all input and output table instances are stored in the Generic Database. This configuration is especially useful if you prefer to be able to replicate past calculations. Run the demo function WriteTablesToExternalDatabase which generates test tables as mock inputs and stores them in external database. You need to create two databases, one for external (externaldb) and one for generic (finaquantdb), and update the connection strings before you run this function. Let’s have a look at the input tables. 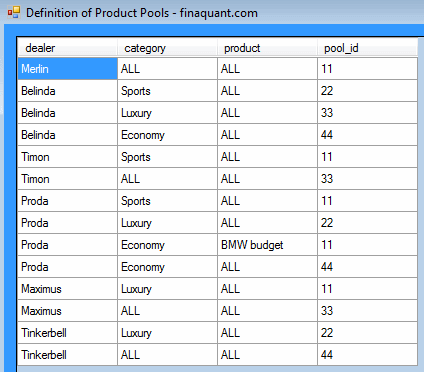 In this table product categories and/or individual products are mapped to a Product Pool for each dealer. 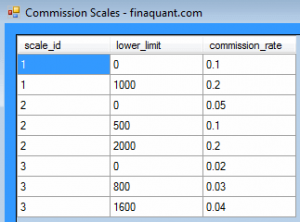 This input table determines which Commission Scale is assigned to each pool, and which scale logic (class or level) is to be applied for each pool. Now that we have our input tables secured in a database we can go on with table functions to formulate the commission calculation. Commission calculation can be formulated and tested first with table functions only without bothering for Calculation Nodes or any database connection. All these operations are done with in-memory tables. The calculation works as expected. In the next step the whole formula can be broken down to manageable smaller formulas, and each formula (i.e. 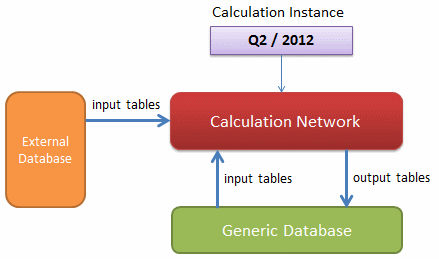 high-level table function) is assigned to a particular Calculation Node in the Network. Next step is configuring the behavior of Calculation Nodes: How they read and validate input data, which events are triggered at what time points, how the input and output table instances are stored, and so on. Event functions ReadSales and ReadProductPool are fired before reading the input tables from the Generic Database. These event functions read data from the external database and write them to Generic Database, unless external tables are exactly identical to the table instances already stored in Generic Database. Calculation Node reads its input tables from the Generic Database, applies the assigned validation rules and function, executes the table function of the node CalcAggregateSales and generates resultant output table SalesPerPool. This output table is stored in the Generic Database. Event functions ReadScalePoolTable and ReadComScaleTable are triggered before reading the input tables from the Generic Database. These event functions read data from the external database and write them to Generic Database, unless the external tables are exactly identical to the table instances already stored in Generic Database. Second Node reads its first input table directly from the first Node (in-memory); not from the Generic Database. 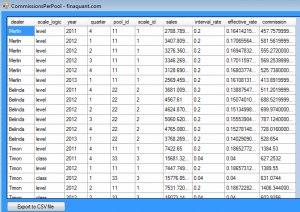 2. and 3. input tables, PoolToScale and CommissionScales, are read from the Generic Database. Both output tables are stored in the Generic Database. 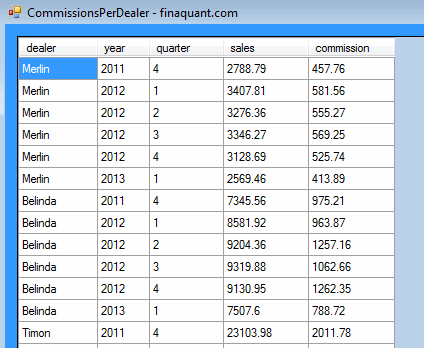 Calculate Sales Commissions for the given Calculation Instance. As an example, for the 2nd quarter of 2012. If you want to calculate the commissions for another period, you just need to update the Calculation Instance, and re-execute the Network. 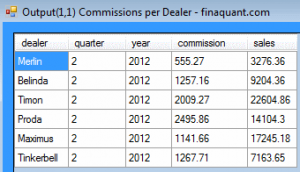 In this article we demonstrated a simple but extendable Commission Calculation. Describe the calculation scenario with its input and output tables. Prepare input tables and expected outcomes to test the results. Formulate calculations first with table functions only, without Calculation Nodes & Network, or any database connection. If necessary, database connection can only be used to feed in the input data. If the table functions work as expected, break the big formula down into smaller formulas and distribute them to Calculation Nodes considering factors like transparency & easy overview, testability, reusability, scalability and performance. 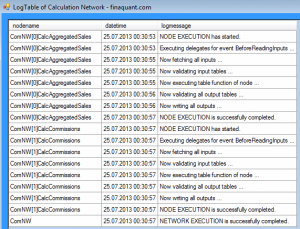 Configure the Calculation Nodes, and add them to Network. 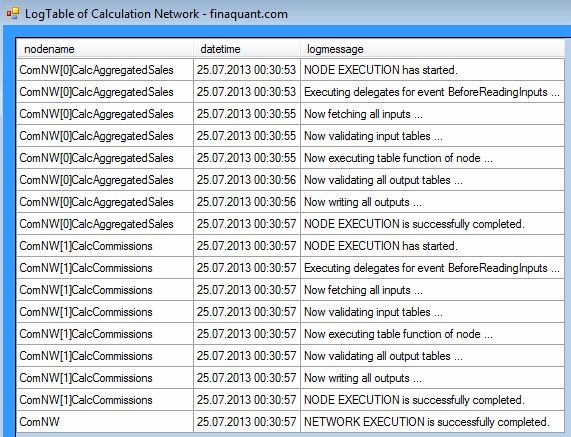 Execute the Calculation Network for multiple calculation instances, and check the results. Periodic calculations can be automated by triggering the node execution once or multiple times in each period using a .net timer, or a workflow manager for scheduled tasks. Follow us at our Facebook and/or Google+ pages for more up-to-date product information. This entry was posted in Fee and commission calculations and tagged commission, table functions. Bookmark the permalink.